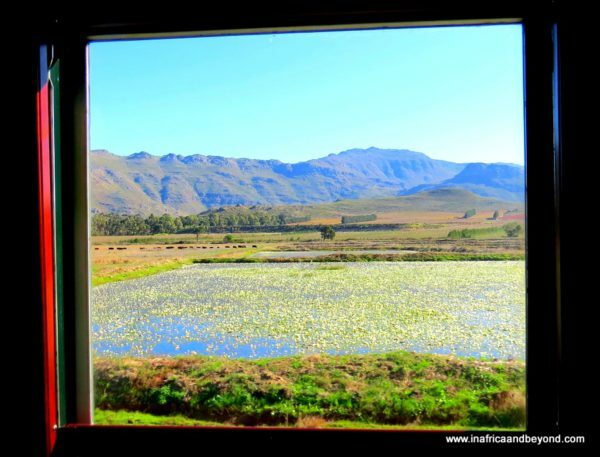 I sat at the window of my ultra-luxurious suite and watched Africa go by. As the landscape transformed from congested city stations to open rivers and velds, the sky, tinged by an unobstructed sunset, changed its hues from golden yellow to burnt orange. 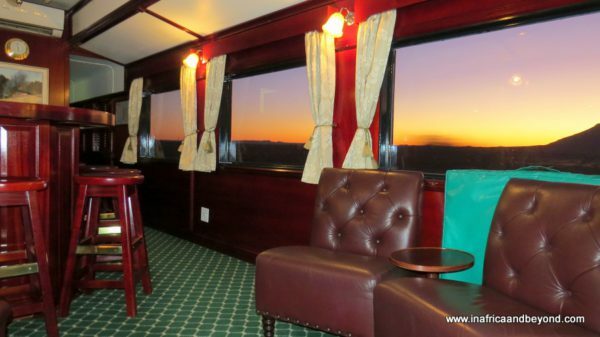 I was transported to a bygone era where the privileged were indulged, people had to dress for dinner, and tycoons like Cecil John Rhodes and Barney Barnato ruled their empires and experienced the magic of Africa on luxurious trains like the Rovos Rail . 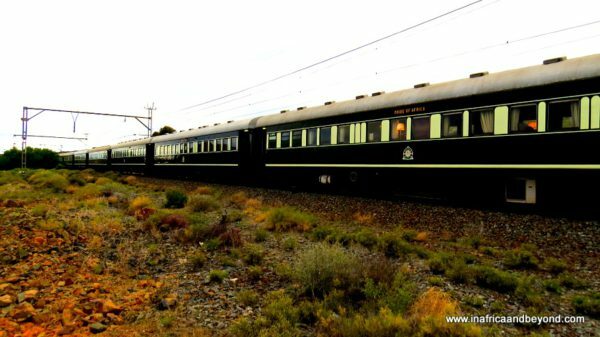 The story of Rovos Rail is an impressive one. It began in 1989 with one man’s dream and determination. Despite several obstacles, Rovos Rail is now a well-established, thriving business with several different itineraries including trips to Victoria Falls, Dar es Salaam and Cairo. Its international reputation for offering truly world-class travel experiences is proof of the enduring nostalgia and romance of train travel in a weary world. Our eclectic group of fellow travellers hailed from Hawaii, England, Scotland, Australia and South Africa. Like us, they were all there to experience one of the most luxurious trains in the world. 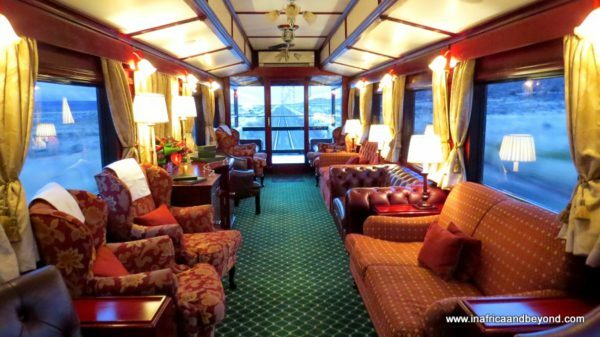 Our journey began at the elegant lounge of Rovos Rail’s colonial-style station at Capital Park in Pretoria where we were welcomed with drinks and snacks. We were then given an introductory speech that set the tone of anticipation for the journey and made us tingle with excitement. 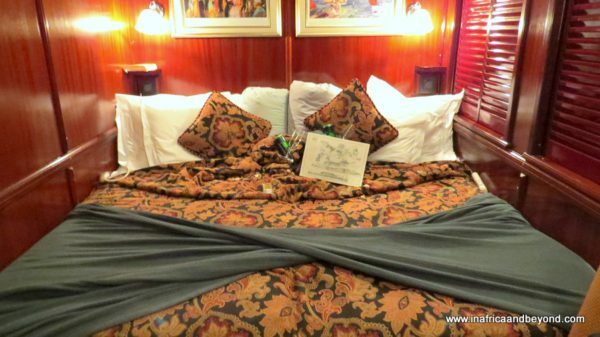 Thereafter, we were escorted to our exquisite suite on The Pride of Africa. 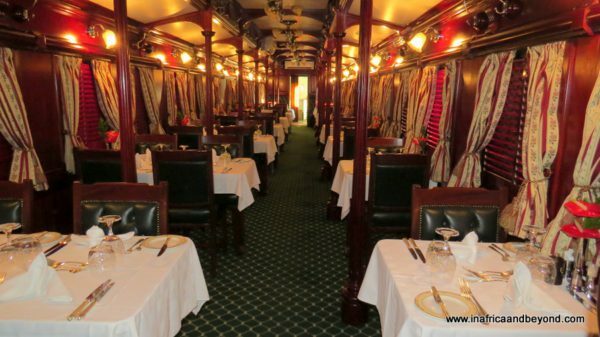 Rovos Rail’s refurbished carriages date from the early 1900s. The Edwardian style décor is subtly complemented by modern conveniences. 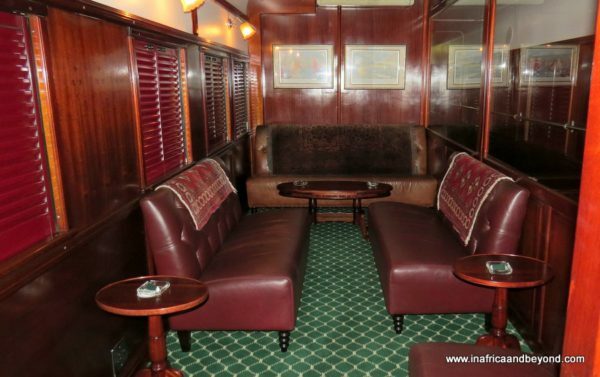 Dark wood panels and emerald and gold carpets enhance the elegance of the train. There was a lounge car with a gift shop, and a dining car at one end and an observation car with a balcony, a small library and a smoking room at the other. The sleeping cars were nestled between both ends. 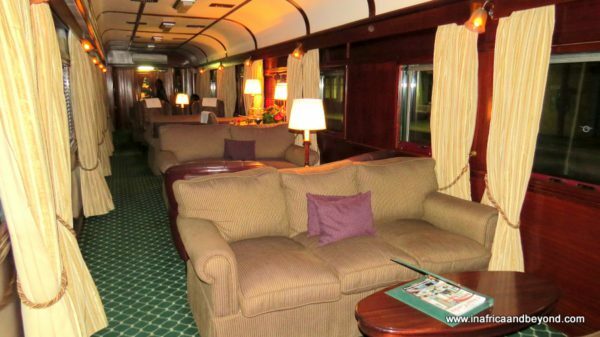 The lounge and observation cars were stocked with board games and leather-bound books and magazines and had huge glass windows ensuring that we didn’t miss the views. My personal favourite was the balcony at the end of the train which offered an unparalleled open-air vantage point. Staff were always on hand to replenish our drinks and snacks as we captured umpteen photos of some of the most kaleidoscopic scenery imaginable. We passed harried commuters on train platforms, and little shacks from which the inhabitants waved to us. We went through dark mountain tunnels and rode through arid desert, crossed meandering rivers and passed verdant vineyards. There are three cabin classes, all en-suite. Our deluxe room consisted of an all-day double bed (unlike most luxury trains where the beds convert to seating during the day), two armchairs, a writing desk with a fully-stocked bar fridge and wardrobes with a built-in safe. Optimum use of is made of the available space and 5-star conveniences such as bathrobes and slippers are provided. The bathroom heater and heated towel rails were especially useful during the cold nights and mornings. 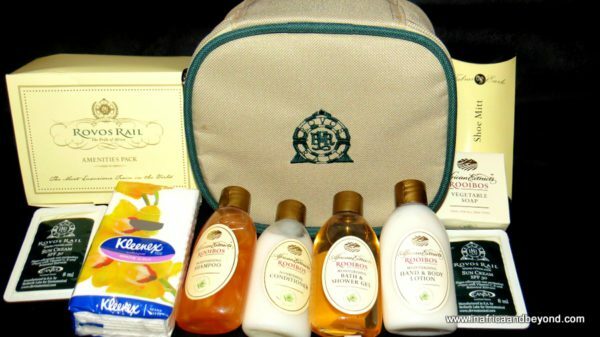 The Royal Suites include a bathtub and are the most spacious suites on any tourist train in the world. Our room needs were taken care of by our personal hostess, Nazeerah, who was always just a call away. Whenever we returned to our room it had been discreetly tidied and our supplies had been replenished. In the evenings, while at dinner, our beds were turned down and heated and the lights dimmed. There was something incredibly comforting about being rocked off to sleep by a moving train while ensconced in a comfortable bed with fine cotton linen, heated by electric under-blankets. Meal times were announced by a gong. Dinners were events involving suits and evening dresses. Flowers were pinned on to our lapels. We sat at tables with starched tablecloths and napkins and were served in bespoke crockery and crystal glasses. Our 5-course meals were a celebration of local delicacies such as lobsters, milk tart and koeksisters and were served with scrumptiously prepared seasonal fruit and vegetables. In between courses, we had the opportunity to gaze out of the windows. High tea was served every afternoon and only our waistlines suffered. The spectacularly memorable sight of thousands of pink flamingos upon Kamfer Dam, indicated our arrival into Kimberley. 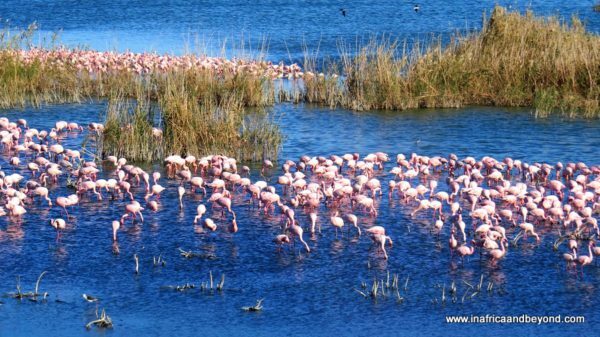 The dam is one of only six breeding sites for lesser flamingos in the world. A short while later, we disembarked and were taken on a tour of The Big Hole Museum, the largest hand-dug excavation in the world, and its surrounds. I had been to Kimberley before but on this visit we were accompanied by an entertaining and informative guide, Frank Dippenaar, who greatly enlightened our knowledge of the Diamond City while simultaneously treating us to a laugh a minute. The following day, about 5km before Matjiesfontein, those brave enough to do so, were dropped off and left to walk to the village. Matjiesfontein is a small but perfectly preserved Victorian village with an impressive history. 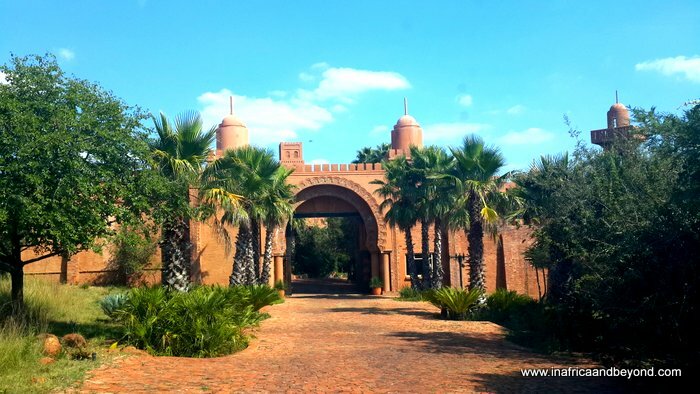 It was founded in 1884 by a Scotsman and established as a health resort which was frequented by affluent people from around the world, including the Sultan of Zanzibar. The cool, refreshing morning walk amidst the expansive Karoo plains was a great way to start the day. As we approached the village, we were sung to by a group of children, eagerly awaiting benefactions from the tourists. After the Victorian stamp of approval was obtained, we boarded the train again and headed for the Mother City. And a few hours later, we gathered on the balcony to watch the iconic Table Mountain come into view. The service was impeccable, led by example from the top. Rohan Vos, the owner of Rovos Rail, was waiting to welcome us at Cape Town station and personally assisted us with our luggage to the car, We were amongst the last passengers to be picked up but he ensured that we were safely seated in our transport before leaving. It was a gracious end to a grand journey. I now cease to see trains as just a mode of transport but rather a journey unto themselves. It is delightfully indulgent not to have to worry about deadlines and household chores, your only task to enjoy the decadent and opulent lifestyle on board as you glimpse into the soul of Africa. An indelible impression has been made on me and my appetite for train travel has certainly been ignited. See Rovos Rail’s video here. For more information, visit Rovos Rail or contact reservations@rovos.co.za . This sounds like such a wonderful experience! I had no idea such trains or journeys even existed in Africa! The level of service and all amenities would probably rival that of many hotels I’ve stayed in. There are some incredible views in your photos too! Whoa! I would love to be a passenger on this train. Your pictures and description brings to life your experience. 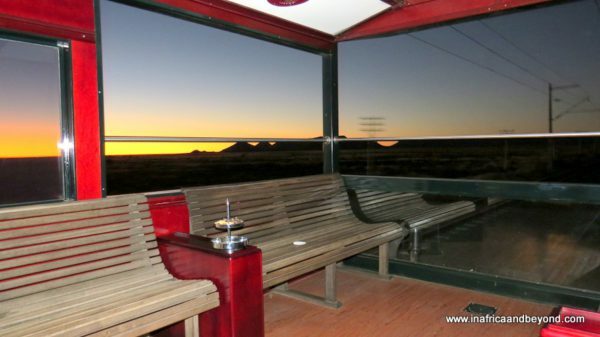 I wish to hop on this train and see the views of Africa too. Thanks for sharing! I love the interior of this train, so unique! The route sounds amazing as well, you must get some incredible views on the way! 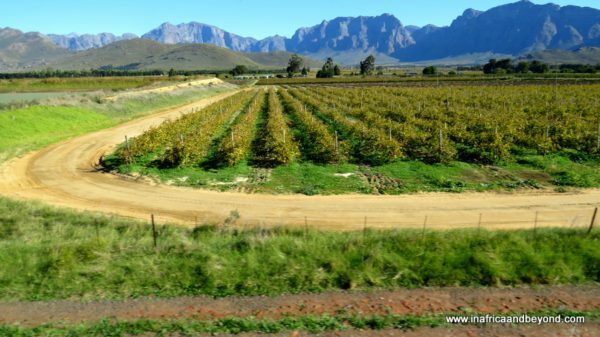 Rovos Rail has some impressive destinations! You really don’t have to worry about anything whilst on board. The views are amazing, then you get to go back to your ready made bed for the night. This is awesome! It looks so amazing and it is now definitely on my wish list. I have a love of train travel that dates back to my childhood when mum would take us on long train trips to visit family in rural Australia. We always had some much fun on those journeys that I jump at the chance to take a scenic train ride these days. This looks like the perfect way to explore South Africa. Rovos Rail is fabulous. Back in India, there are a number of luxurious trains and taking a ride in them is like living a dream while one have some of the best glimpses of the country. Thank you for this post. Very informative and helpful. In India we have so many luxuries trains like Palace on wheels, Maharaja Express. Train journey are really good and give a great view of countryside. 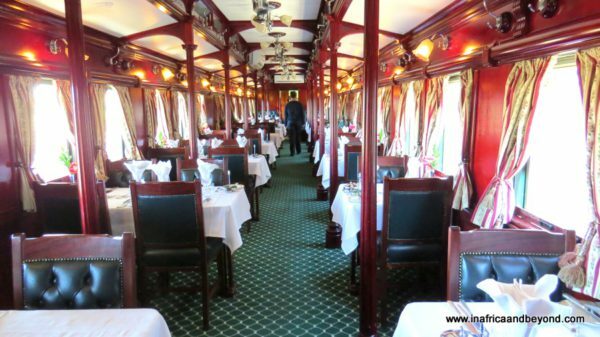 Luxury trains make these experience more special.